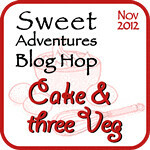 I think that’s something that myself and many of the other bloggers joining this month’s Sweet Adventures blog hop may be repeating to potential taste-test subjects as we get creative for the theme of vegetable-based dessert. Carrot cake and pumpkin pie are pretty standard, so I wanted to do something a little different. I thought about the lovely creamy texture of pureed cauliflower and wondered if I could get away with using it as an actual substitute for cream. Thus this recipe was born! I decided to go a little bit chef-fy and serve it up with homemade honeycomb, raspberry coulis and basil (I’m already putting cauliflower in a dessert, so why the hell not?). The panna cotta will need at least 4 hours to set but should not be made more than 24 hours in advance. The coulis and honeycomb can be made up to a week ahead. This recipe makes 6 servings in 125mL panna cotta moulds. Using a food processor or Thermomix, finely chop the white chocolate. Remove and set aside. Process cauliflower into small pieces. Add sugar and cream and cook on medium heat for around 25 minutes or until cauliflower is soft (don’t let the cream boil). If using thermomix, cook for 25 minutes at 90 degrees on speed 1. Remove from heat and puree until smooth. Transfer the mixture to a bowl. Add white chocolate and stir until melted. Allow to cool slightly. Sprinkle gelatine over the mixture and whisk to combine. Pour the mixture into lightly greased panna cotta moulds. Refrigerate for at least 4 hours to set. Combine all ingredients in a pot. Cook over medium heat until raspberries are soft, sugar is dissolved and mixture is thick. Coulis will keep in the fridge for up to a week. Grease or line a baking tray and have it ready before you start this recipe. Combine honey, water and sugar in a large pot over low heat. Cook, stirring occasionally until sugar is dissolved. Increase heat to high. Cook without stirring until mixture reaches 150 degrees C on a candy thermometer. Working quickly, remove pot from heat and add bicarb soda. Beat mixture vigorously with a wooden spoon. It will foam and expand. Tip mixture onto tray and spread out in an even layer. Allow to cool until set. Dip panna cotta moulds into hot water for a few seconds or use a kitchen blow torch to loosen. Invert moulds onto serving plates to release panna cotta. Drizzle over coulis and garnish with raspberries, basil leaves and honeycomb shards. The cauliflower balances out the sweetness of the white chocolate and makes the panna cotta nice and light. The tart raspberries and aromatic basil are a perfect match for it. The honeycomb tops it all off with a lovely burnt-sugar flavour and crunchy texture. I think I’ve struck gold with this one! Thanks I wasn’t sure if it would work either, but it turned out ok thankfully! This looks truly amazing! Very creative, well done! WOW do you have a Thermomix? This looks AMAZING and I love the way you’ve plated it!